NETWORK FINALS: THURSDAY NIGHT FOOTBALL adjusted up to 4.1 in final numbers, quite a bit higher than this morning’s preliminary rating, but still considerably lower than the 6.1 for the last CBS primetime game 2 weeks ago. Elsewhere, the entire ABC line-up lost 0.1 across the board, while SUPERSTORE gained 0.1. CABLE HIGHLIGHTS: It was a night dominated by sports and weather concerns. TBS led Thursday cable with the Red Sox vs. Indians BASEBALL PLAYOFFS at 1.36, while the afternoon Blue Jays vs. Rangers game was at 0.56. NFL Network had to share THURSDAY NIGHT FOOTBALL with CBS, after having the game to itself last week, which plunged its rating by 1.69 to 1.31. 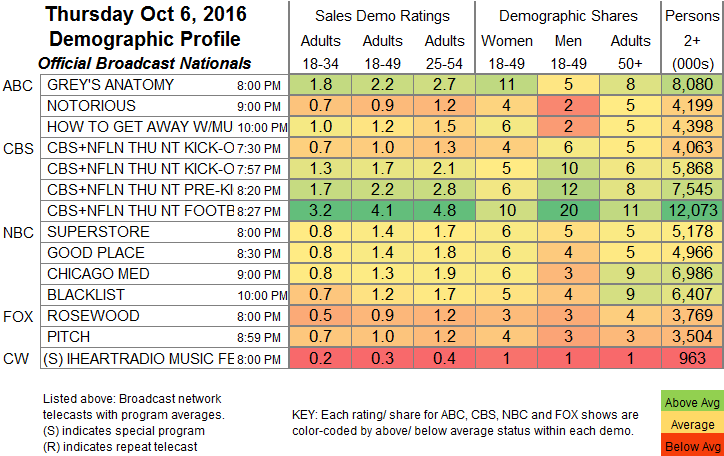 The Weather Channel had 7 of the Top 15 ratings of the night with its Hurricane Matthew coverage, peaking in the 10PM hour at 0.57. A&E’s 60 DAYS IN was down 0.03 to 0.54, and BEHIND BARS was down 0.07 to 0.24. Lifetime’s PROJECT RUNWAY gained 0.04 to 0.51. Tru’s IMPRACTICAL JOKERS returned at 0.44. On HGTV, HOUSE HUNTERS slipped 0.02 to 0.35, HOUSE HUNTERS INTL ticked down to 0.35, and DESERT FLIPPERS added a tick to 0.29. 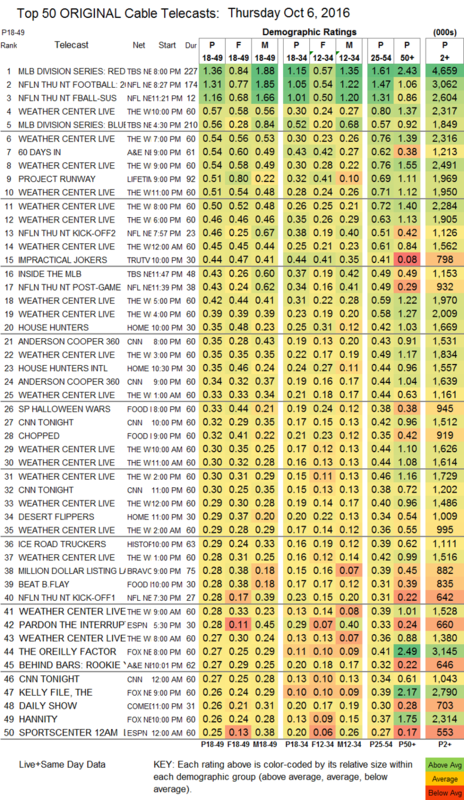 Food Network’s HALLOWEEN WARS was at 0.29, CHOPPED rose 0.04 to 0.32, and BEAT BOBBY FLAY was up 0.04 to 0.28. History’s ICE ROAD TRUCKERS held at 0.29. Bravo’s MILLION DOLLAR LISTING LA was at 0.28, and NY was down 0.04 to 0.22. On MTV, WILD N OUT ticked up to 0.25, and JOKING OFF was up 0.02 to 0.16. FX’s BETTER THINGS gained 0.05 to 0.20. On We, JIM & CHRISSY rose 0.03 to 0.20, and CUTTING IT IN THE ATL was down 0.03 to 0.13. TLC’s THOSE WHO CAN’T was at 0.18. Logo’s RUPAUL’S ALL STARS fell 0.03 to 0.14, with the VH1 simulcast down 0.02 to 0.13, and Logo lead-out FINDING PRINCE CHARMING gained 0.02 to 0.08/137K, but still fell off the chart. Also off the chart: POP’s IMPACT WRESTLING, down 0.02 to 0.06/305K.